What would a no-deal Brexit mean for you? Media captionHow could a no-deal Brexit affect me? Three industry experts give their assessment. The UK is due to leave the EU on 29 March next year - with the UK government insisting it's still confident of negotiating a deal on the divorce terms. But with fundamental differences remaining between the two sides as talks enter the crucial phase, recent weeks have seen an increasing focus on the possibility of no agreement being reached. 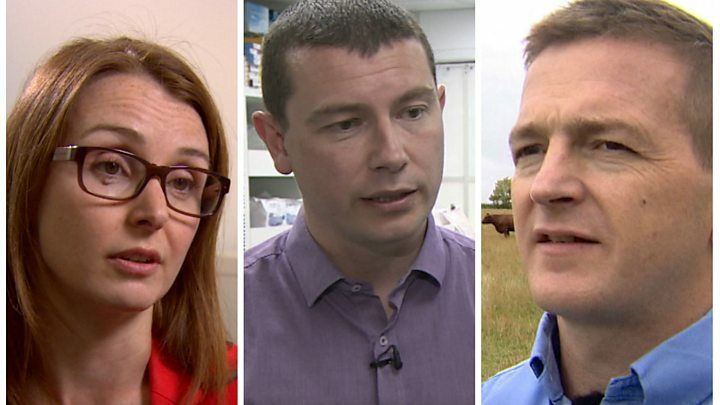 We asked experts working in the front line of Scotland's tourism, food and medical sectors some key questions about what they think a no-deal Brexit might really look like. It's impossible to say at this stage what the impact might be on the price you pay a travel agent for your holiday, according to Emma Brennan of travel industry organisation Abta. But she says there could be additional costs for British holidaymakers if they suddenly need to apply for a visa to visit European countries which don't currently require one. Abta is also concerned that the possible loss of European Health Insurance Cards could push up the price of travel insurance. And British travellers could find themselves back in the bad old days of having to pay large data, call and text message charges if they want to use their mobile phones abroad - something they haven't had to do since June of last year, when roaming charges were ditched across the EU. Tourists will already have noticed how a fall in the value of the pound since Brexit means their cash doesn't go quite as far as it once did when they are abroad. Ms Brennan says Brexit uncertainty doesn't currently appear to have put people off booking their summer holidays for next year, and any hike in prices for EU destinations could be good news for resorts in countries such as Turkey, Egypt and Tunisia, which are becoming increasingly popular with holidaymakers. She also says it is "difficult to imagine" a situation where planes aren't able to fly to or from British airports even if the UK leaves the EU without a formal agreement. But she has warned that a no-deal scenario could make it tougher for holiday firms to employ enough British staff in EU resorts to provide help and support to holidaymakers. This one was given an unequivocal "no" by David Thomson, the chief executive of the Scottish Food and Drink Federation, who assured shoppers that their local supermarket shelves wouldn't lie empty after a no-deal Brexit. However, he said customers could see shortages of some specific products, at least for a short period of time - similar to what happened during the extreme winter weather that hit the country at the start of this year. Changes to customs arrangements at ports such as Dover could mean delays to deliveries of fresh fruit, vegetables and dairy products from abroad, for example. This could include tomatoes, cheese and chocolate. Mr Thomson said delays to deliveries of goods from the EU would have a knock-on effect for products from other parts of the world too, which would also be left waiting in "massive queues" to get through customs. He said food prices would go up by an average of 13% if failure to secure a deal with the EU saw the UK adopting World Trade Organisation (WTO) rules instead - with non-food goods going up by about 3%. But WTO tariffs mean some fruit, vegetables, meat and dairy products would more than double in price, he said, making some unprofitable for shops to stock. Will I still be able to get medicine? Yes, says Matt Barclay of Community Pharmacists Scotland, which represents more than 1,200 chemist shops across the country. About 90% of NHS medicines are imported from abroad - of which half come from the EU. But he said pharmacists have been given assurances from the Scottish and UK governments that plans are being put in place to ensure there is no disruption to medical supplies regardless of the Brexit outcome. And he said there was no reason for patients to panic about the possibility of suddenly not being able to get their medicine. Mr Barclay said one of the options being explored was for manufacturers to stockpile medical supplies in the UK, which would ensure patients who receive medicine from NHS pharmacies won't notice any difference. He also said pharmacies are used to dealing with complex supply chains - but acknowledged that Brexit was giving them "a bit of an unknown challenge".